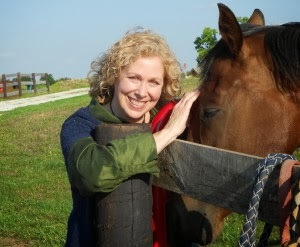 It's been a while since I've had an author interview, so today I'm thrilled to host fellow Colonial Quills member Elaine Marie Cooper. She describes herself as a wife, mom, GiGi to triplets, and lover of history. 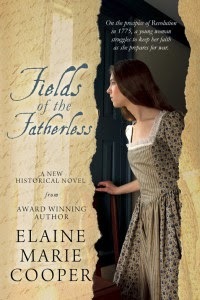 Her latest, a Revolutionary War tale titled Fields of the Fatherless, released yesterday to some great reviews. Elaine, could you tell us a bit about your background and family life, and how you got started writing? I grew up in Massachusetts just outside of Boston. As the youngest of a large family of six children, I remember enjoying my “alone” time and would dabble in writing in my early years. My Dad must have noticed because, when my pet hamster showed up missing one day, he suggested I write a story about my hamster’s adventures roaming the inner recesses of our 100-year-old house! I happily agreed (although I was even happier when “Whiskers” showed up after three days.) He was hungry and thirsty, but unharmed. I continued writing for fun, dabbling in poetry and even a television script which one of my friends and I acted out. “The Man from U.N.C.L.E” was never so dynamic! LOL! It wasn’t until I was an adult that an editor saw some of my informal work and she offered me an opportunity to freelance feature stories for the newspaper. As a young Mom, I was delighted to be able to work like that and be a stay-at-home parent. Within a year or so I had worked my way into writing two regular columns a week and I even wrote stories for a second paper as well. Besides numerous articles that were published in the late 1980’s in the San Bernardino Sun Newspaper and the Redlands Daily Facts, I also saw several of my short articles (usually health-related) appear in Better Homes & Gardens Magazine. I took a long writing hiatus after my daughter passed away in 2003, but the Lord re-stirred my writer’s heart in 2007. That’s when I started writing and researching historical fiction. My first book was ready to submit in 2009 but, unfortunately, the publishing industry was in a big slump and not ready for new writers. Undaunted, I self-published my first two books (The Road to Deer Run and The Promise of Deer Run). The third book in the Deer Run Saga (The Legacy of Deer Run) was contracted with Sword of the Spirit Publishing. (That publisher will pick up the first two books later this year). My new release, Fields of the Fatherless, is contracted with Lighthouse Publishing of the Carolinas. I think I’d have to say that my influences as a writer began in my teens when I read biographies by Irving Stone. He brought historical characters alive with his riveting novels about famous folks in history, like Abigail and John Adams, Rachel and Andrew Jackson, and Mary Todd and Abraham Lincoln. As a teen I also enjoyed the historical novels of Taylor Caldwell. My favorite book from my early reading years is Jane Eyre by Charlotte Bronte. I can still envision the window seat that Jane used as her escape from her abusive family. The book made such an impression upon me with Jane’s strength in the midst of hopelessness and her elegant spirit in the midst of poverty. An inspiring character! The Christian writer who has had the greatest influence on me is Karen Kingsbury. Although she is an author of contemporary fiction, I was swept away by Kingsbury’s ability to tell an inspiring realistic tale that draws me closer to God. Although fictitious, her stories depict real life and I so appreciate her honesty and her engaging characters. Karen is definitely wonderful, warm and real. Now, what sorts of things stir the pot of creativity for you? Music, artwork, certain films, etc. And what do you do when you aren't writing? Ha! That does seem to be a necessity upon occasion, doesn't it? Do you have a favorite place for writing? Do you try to work each day until you're "done," or do you have certain hours, or daily word count goal? I really concentrate on my writing best in my home office that feels like a cave of clutter. But creativity seems to roll in the midst of my chaos! With so much going on in my life, I have no set schedule—every day is a bit different, but always filled. I always stop to have dinner with my husband then usually jump back in to my work. I watch little TV but my husband and I always love a good movie at home together or, on a rare occasion, go out to a matinee. I know of many writers who go by a daily word count goal, but I can’t relate. I write until I have to stop, whether it’s 400 words or 4,000. Just like with word count goals, I don’t work well with outlines. (I’ve disliked outlines since I was in school!). I have an overarching idea of the story from start to conclusion, and then let my fingers follow my muse as I fill out the story. Often, those characters insist on writing their own stories with unexpected twists and turns! Sneaky, willful characters ... they're the best! What are you working on now, if you don’t mind sharing? What do you hope to be working on? My current project is a non-fiction work that the Lord laid on my heart to write over two years ago. While attending a Christian writer’s conference, I felt impressed that I needed to write a memoir of my daughter and her battle with brain cancer. It was a book I had avoided even considering writing for several years but I felt the Lord telling my heart that He would give me the strength to endure the pain of the re-telling. He has been faithful. The unfinished manuscript is tentatively entitled, Bethany’s Calendar. My hope is that my story will enable other families to be able to cope with such an illness and loss, and empower them to be advocates for a loved one going through a serious illness. When this manuscript is complete, my hope is to return to another historical fiction project. There are so many stories from history begging to be told! I know just what you mean, Elaine, about the stories from history. And blessings on you and your family after your loss! We really do learn to appreciate life in a new way afterward, don't we? I'll be praying as you work on this project. Okay, the last question is this ... what 3 bits of advice would you give new (or not so new) writers? First, write from your heart. What are you passionate about? If you are not convinced a story is worth telling, that lack of passion will be evident in the story. Love your characters. Bleed into your words so that a reader feels the depth of that zeal. Help the reader love your characters as much as you do. Second, learn the basics. You may have a writer’s heart and talent but need some refining. You wouldn’t want the pilot of a jet who had natural aeronautical skills to forego flight school! Look to the experienced legends in the field like Cecil Murphey to glean wisdom and knowledge. Look for a Word Weavers group in your area so you can connect with other writers to help you grow in the craft. Third, write with your own voice. You may have heard this term before but basically it means, write so that your personality shows through. I remember reading a guide for letter writers when I was a young girl and it said, “Write a letter to the person as though you were speaking face to face with them.” I’ve never forgotten that small piece of advice and I think it holds true in a book, whether fiction or non-fiction. Don’t write a dry textbook—let your words shine! Elaine, thank you so much for spending time with us! You can read more about Elaine at her website, www.elainemariecooper.com.